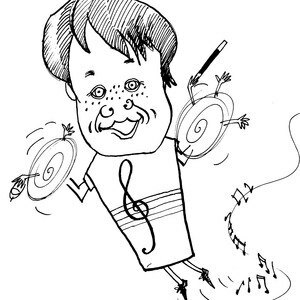 The cartoon of me by Martin Ursell from his book How to Draw Cartoons, illustrates what a typical day is like for me. I juggle designing lots of different projects at once – adult and children’s books, greetings cards, programmes, etc. as well as having various hobbies – knitting, singing, swimming... After studying at Grays School of Art, Aberdeen and the London College of Printing, I started my career in book design at Faber & Faber. I then worked for a few publishers including Macmillan and the BBC, during which time I worked with children’s characters such as Winnie-the-Pooh, Babar, Wallace & Gromit and Pingu. I became a freelance Art Director about twenty years ago and started working with b small not long after that. I also design for a few other publishers and organisations. I work from a tiny studio in our flat in Wimbledon Village. We are also lucky enough to have a flat in St Ives, Cornwall, where we escape to when we can. My partner. Emlyn, is an opera singer, so there is always music going on in the background.